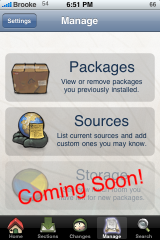 There are a couple of cool mods in Cydia that I thought I would mention. One is a dialer mod that is actually similar to very popular dialer mod for firmware 1.1.4 and below. 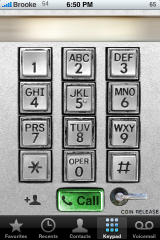 Retro Phone Dialer (via modmyi) will change your dialer keypad to look like an old school pay phone dialer…it’s pretty cool! The other mod is a Cydia theme. enBuufydia (via modmyi) is a mod that will change Cydia to match the Buuf theme. I know quite a few of you use the Buuf theme so, here is just one more thing you can mod to match your theme! 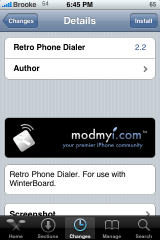 Both mods can be activated and deactivated via WinterBoard with no issues. Below are the screenshots of both mods. Can we see a picture of Brooke, I’m just curious…. That would be me in the upper right corner of the page when it loads. Also, it sounds like you haven’t seen our video podcasts! You should totally check them out!